Solar Panel Cleaning primarily in Burlington, Oakville, Mississauga, Hamilton, Carlisle, Kilbride, Waterdown, Milton but we can cover all of Ontario for large solar farms and arrays. Solar panels (photovoltaic modules) are as much as 30% less effective whenever they are dirty. Clean Solar Panels save more money in production, compared to the cost of getting them cleaned. 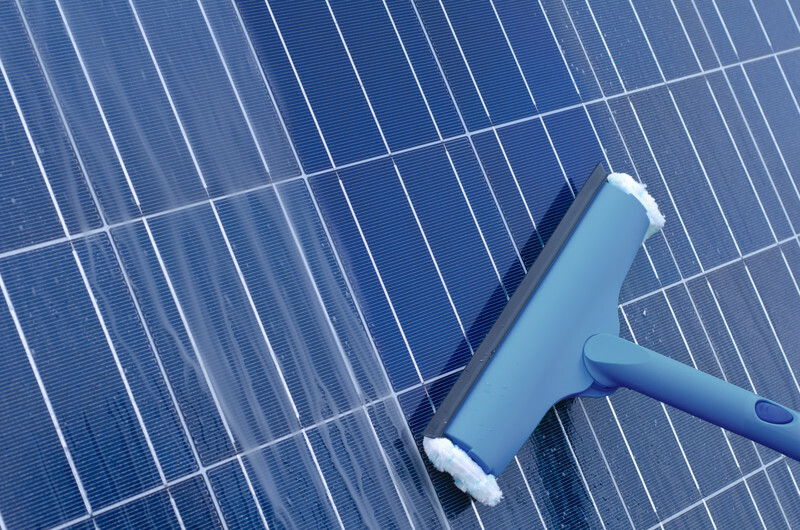 Frequent solar panel cleaning maintains your investment and lengthens the lifespan of the panel. Getting your solar panels cleaned helps maintain the manufacturers warranty. It is easy to understand the benefits of our bespoke Solar Panel cleaning solutions we use in Burlington, Oakville, Hamilton and most of Ontario. Clean solar panels are able to function more efficiently , generating more power so saving you more money. We utilize 100% pure water, no chemicals or detergents that leave residue that actually attracts dirt and dust. The results are a sparkling solar panel that absorbs 30% more of the suns energy, thus saving you money and extending the life of each panel. Your Solar Panels are going to be cleaner – our purified water has all residue removed so no white marks will remain on your PV panels after we have finished. Once we have cleaned your solar panels the water helps repel dust for a longer period than if cleaned with soap and water. Chemical free solar panel cleaning is our preferred choice in servicing your solar panels, this ensures no damage is done to the seals or glass. We always focus on safety first, we do not lean or touch your solar panels, our system allows us to reach 60 feet from the ground or on the roof. Using special solar panel brushes to ensure no damage is done the the surface of the solar panel, no scratches or damage can occur. Have your solar panels cleaned by cleaner windows it’s a difference you really can see, you will notice a difference when your production increases when we finish the job.